A lot of ready-to-use pictures for setup dialog boxes are included in Visual Installer. These pictures will give the dialog boxes in your installation programs a professional look and a great first impression of your product. You can also choose your own pictures to the setup dialog boxes in Visual Installer if you for example want to give the installation program a graphical profile that matches your application or company's graphical profile. 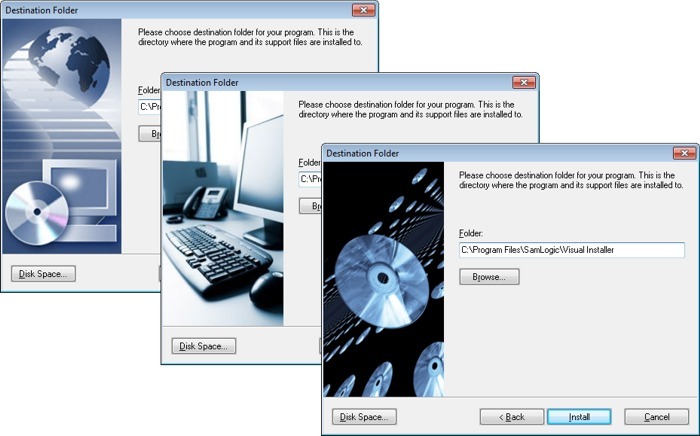 Below are some samples of setup dialog box pictures that are included in Visual Installer. More samples are available on this page.